LOS ANGELES – Moments after the game Wednesday night, a security official shouted for people to move to the side. Down a hallway came two men with two black crates, one stacked on top of the other. Quickly and quietly, the men rolled the crates down a ramp to a nondescript silver minivan idling in the loading dock. They packed them in the trunk of the Honda Odyssey and hopped in. They drove up another ramp and turned right onto the street outside as the sun set in the soft pink southern California sky. Just like that, the Stanley Cup and the Conn Smythe Trophy were gone. The New Jersey Devils spoiled the party with a 3-1 victory, denying the Los Angeles Kings the sweep, the historic record, the chance to celebrate in front of the fans who have been waiting 45 years for this. The odyssey heads back to Newark, N.J., for Game 5 on Saturday night. "Maybe it would have been a little more sentimental winning it on our home ice," said Kings captain Dustin Brown in a somber dressing room, with cases of champagne no doubt hidden somewhere nearby. "But if we win it there, we bring it right back here." The odds are still very much in the Kings' favor. Only three teams have ever come back from a 3-0 deficit and won a seven-game series in the NHL, and only one of those teams did it in the final, and that was way back in 1942 when the Toronto Maple Leafs pulled it off against the Detroit Red Wings. The Kings are 10-0 on the road. They have lost only three times in the playoffs, and their other two losses also came in Game 4 at Staples Center when they had a 3-0 series lead. Both times, they won Game 5. It was funny to listen to rookie Adam Henrique and veteran Martin Brodeur talk about the Devils' situation. Henrique is 22. He scored the winner Wednesday night, after scoring two series clinchers in overtime earlier in the playoffs. He must think anything is possible. "We know we can do it," Henrique said. "We know we can put four together and come back." Brodeur is 40. He has won three Cups and suffered many playoff disappointments, too. He must know this won't become a series unless the Devils can win another one, putting pressure on the Kings to close it out at home in Game 6 and avoid an anything-can-happen Game 7. 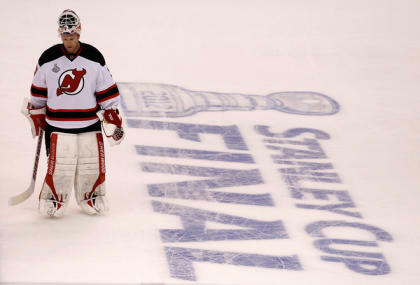 "Regardless of what happens next game," Brodeur said, "at least we won one game." At least the Devils avoided what would have been the first sweep in their franchise's history, and at least they kept the Kings from making history. Had the Kings won, they would have equaled the 1988 Edmonton Oilers' 16-2 record, the best since the NHL went to four best-of-7 playoff series in '87. And really, that is justice, because this series had been closer than it appeared. Through two games, the Kings had scored the same number of goals in regulation that the Devils had – two. Games 1 and 2 were both 1-1 going into overtime. Both could have gone either way. Both went the Kings' way. Even Game 3 was tight. The Kings won, 4-0. But goaltender Jonathan Quick had to keep them in it through the first period and into the early part of the second, before L.A. jammed home a dirty goal and the superstars broke it open. "We feel we've been playing really well this series but with zero result," Brodeur said. "It's hard." Game 4 was hard, too. Everyone was anticipating a Kings victory. The scoreboard announced before the game: "IT'S CUP TIME." The fans chanted: "WE WANT THE CUP!" With the game scoreless in the second period, Phil Pritchard and Craig Campbell, the keepers of the Cup from the Hockey Hall of Fame, drove from their airport hotel through the thick L.A. traffic to Staples Center in case they needed to crack open those crates. The Devils didn't need to be told the Cup was present. "Duh," said Devils winger Patrik Elias. "They were winning, 3-0, so it better be here." The Devils took their first lead of the series 7:56 into the third period when Elias swiped a rebound into a gaping net, deflating the building. That lead lasted all of 62 seconds. David Clarkson took a questionable boarding penalty, and Kings defenseman Drew Doughty blasted a point shot past Brodeur on the power play, tying the game, 1-1. "It's a tough play," said Devils center Travis Zajac. "We thought it was a bad call to begin with." That reinflated the building but didn't deflate the Devils. Coach Pete DeBoer told them to keep forechecking, keep skating. Clarkson didn't need to make up for the penalty, but he did anyway, sending a pass across for Henrique, who kicked the puck up to his stick on the left wing and wired a shot past Quick's blocker. Not only did Henrique give the Devils a 2-1 lead, he gave them confidence. That was the first time all series they had beaten Quick with a clean shot, and that was the first time all series they had put a crooked number on the scoreboard. An empty-netter by Ilya Kovalchuk was a bonus. "Scoring more than one goal helps that," Zajac said. "We played well. We knew that if we stuck with it, good things would happen, we'd get a bounce our way. Today finally … finally we got a win." Even if the odyssey needs to go back to L.A. and back to Newark again before the Cup's frequent-flier miles mean much to the Devils, at least the Cup and its keepers are headed East this time – and so are the Kings. "I think we wanted to make them jump on a plane and come to New Jersey," Brodeur said. "We had to go, anyway. Might as well get a game over there." "I think it's a tough situation for us to be in," he said. "We pulled it off, one game. We'll take it one game at a time. But I'm sure they're not happy to make that trip. We'll try to make it miserable for them again."